Put together two unrelated ideas or words and you may get a spark- French saxophonist Emile Parisien’s tune titles have a Surrealist humour that jolts any fixed ideas.Chien Guêpe (Dog Wasp), Dieu M'a Brossé Les Dents (God Brushed My Teeth) and Au Revoir Porc-Épic (Goodbye Porcupine- a nod to Goodbye Pork Pie Hat) are typical. The music brings the same sense of the unexpected. The Quartet’s new album on the ACT label Spezial Snack (ACT 9575-2) marks 10 years of playing together. 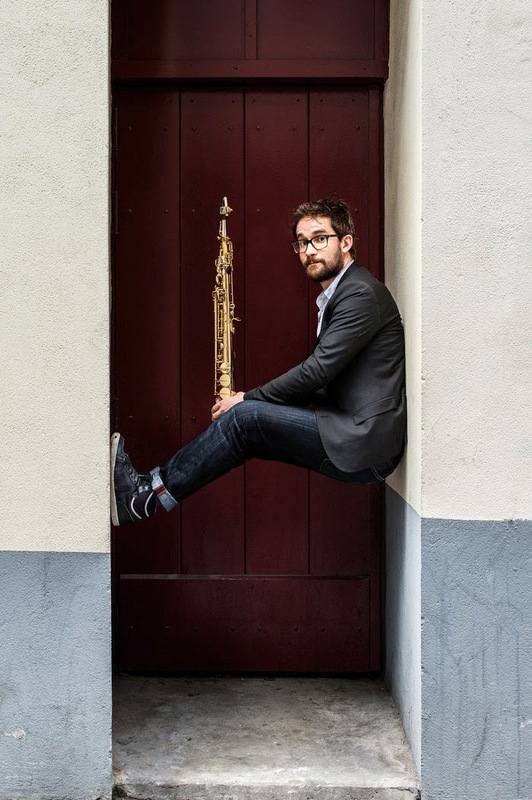 Soprano-player Émile Parisien, Julien Touéry (piano), Ivan Gélugne (bass) and Sylvain Darrifourcq (drums, percussion) all studied jazz at Toulouse Conservatoire. Parisien also studied Contemporary and Classical music, and his technique is such that you feel he could play anything. There’s a lot of trust and freedom to experiment among the band. They all work with other musicians too- Parisien, for example, plays with accordion-player Vincent Peirani and drummer Daniel Humair. They come back together full of new ideas to bring to their eclectic music. Parisien mostly plays soprano- he enjoys its wide ‘sonic palette’. You can hear a strong Coltrane and Wayne Shorter influence in his tone. He names Steve Lacy as an influence too, and it’s there in the freer moments. In earlier albums there are inklings of Balkan and Middle Eastern music, and French Chansons- even references to Wagner and Mahler. Each musician contributes compositions, and each piece has an almost cinematic quality, taking you through many moods from the deadly serious to the highly mischievous- written and improvised. Spezial Snack opens with Potfen: all moody percussion and funky bass, the drumming at times like e.s.t.’s Magnus Öström. Haricot Guide has Neil Cowley-esque rock chords alongside cool school boppy swing and skittish sax riffs. Everyone playfully chases each other’s tails over the extreme tempo changes. Mazout Damnation opens with earthy bowed bass and mysterious creakings (prepared piano?) before the rhythm breaks out, part punk, part Stravinsky’s Rite of Spring. Parisien has played funk with drummer Paco Séry, and even for a hip hop dance project: Les Flics de la Police has a funky insouciance worthy of Ornette Coleman and Prime Time. You also get the chance to hear remarkable UK pianist Alexander Hawkins playing a solo set during the evening.